FreedomPop isn’t content with selling refurbished Sprint phones, so it’s decided to start making its own. Or, more accurately, it’s started paying a device maker to manufacture low-cost Android smartphones. 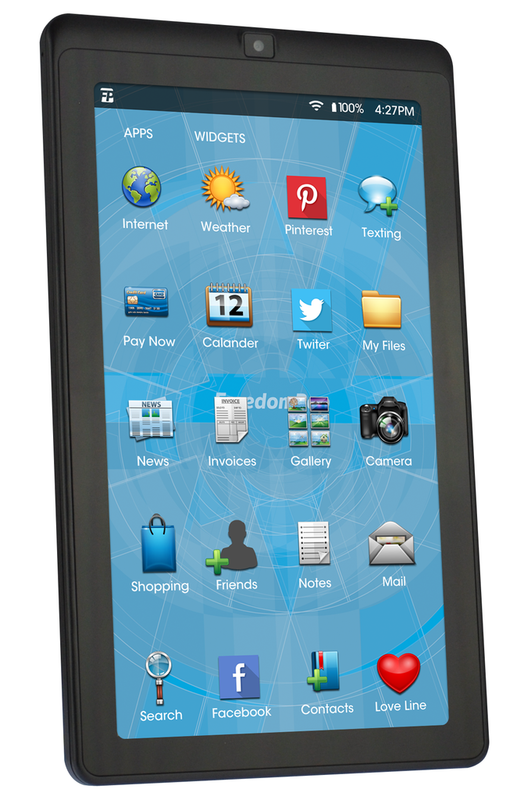 Starting Wednesday, FreedomPop will begin selling the Liberty — a small tablet or extremely large-screened phone, depending on how you look at it – for $89. Most people would call the Liberty a tablet since the device has no cellular connectivity (but does have a 7-inch screen). Its only radio is Wi-Fi, which almost anywhere else would make it a data-only device. But FreedomPop offers its voice and SMS services entirely over IP channels, meaning the Liberty can make calls and send text messages like any cellular device so long as a Wi-Fi connection is available. Starting next month, FreedomPop will offer an LTE version of the Liberty called the Frenzy, which will sell for just $99, and it has a more traditionally sized LTE Android phone priced at $89 slated for late this year or early next. The question you’re probably asking yourself is why a mobile virtual network operator (MVNO) that specializes in budget plans (FreedomPop’s barebones voice and data plan are free) and doesn’t even have a million customers yet is producing its own line of phones. For CEO Stephen Stokols the answer is simple: there aren’t enough sub-$100 smartphones available in the U.S., so FreedomPop decided to create its own market. Since it launched its smartphone plans last October, FreedomPop has been relying almost entirely on refurbished [company]Sprint[/company] phones (since Sprint supplies FreedomPop’s LTE and WiMAX connectivity, the MVNO can only use Sprint-configured devices), but Stokols now estimates he’s buying up 90 percent of Sprint’s refurb stock. “If we’re going to grow to the point where we’re activating 50,000 or 100,000 phones a month, we needed to get another source for devices,” Stokols said. Where exactly FreedomPop is sourcing these phones, Stokols wouldn’t say. He hinted that FreedomPop is working with an Asian device manufacturer, and he confirmed that FreedomPop isn’t simply buying stock phones from that manufacturers. The upcoming 4G phones need to be customized specifically for Sprint’s LTE network (they won’t support 2G or 3G), Stokols said, adding that FreedomPop will use one of the established Android reference designs to keep costs low. A betting man might surmise that the reference design is Android One and the manufacturer is located in India. It just so happens that Android One is launching in India this month targeting the $100 smartphone. There are a few things that don’t add up in that scenario, though. Android One is designed to allow device makers to take advantage of the latest version of Google’s OS, which today is Android 4.4 KitKat. The Liberty runs Android 4.2.2 Jelly Bean, and it also doesn’t meet some of Android One’s minimum device specs. For instance, it has a 4-megapixel rear camera, not Google’s specified 5-megapixel minimum. But [company]Google[/company] isn’t the only one with a phone design in a box. [company]MediaTek[/company] has long supplied emerging markets with low-cost Android phones through its reference design program, and other chipmakers like [company]Qualcomm[/company] offer reference designs as well. 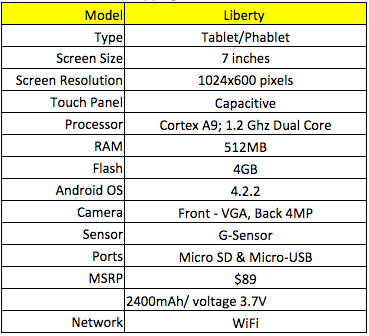 Speaking of specs, the Liberty isn’t going to get hardware junkies salivating, but that’s not the point. The typical FreedomPop customer is paying a few dollars a month for service if they’re paying anything at all. They’re not the type to shell out $600 to $700 for a new iPhone or flagship Android and they’re just as unlikely to lock themselves into two-year contracts in order to get device discounts. According to Stokols, the market has demonstrated there’s a big demand for big-screened phones in the U.S., and like any other carrier FreedomPop plans to deliver them to its customers – it’s just doing so on the cheap. FreedomPop did not live up to their advertising and they cancelled my account. I returned their phone and now they will not reply, I can not reach any live person by phone and I have received no credit for the phone purchase or services not delivered. Are they going out of business? if freedompop had gone with a GSM carrier instead of sprint i am sure they could do fine simply selling SIM cards and letting everyone bring there own phone. would likely shut down FreedomPop to discourage parasites. or turn it into yet another Sprint brand like Boost or Virgin. I would think freedompop merging with a company like magicjack would make sense,as they both offer ultra low cost service.However,while magicjack is in the big retail stores,I noticed that ultra low cost MVNOs such as freedompop and republic wireless are not and wonder if there is something in their MVNO agreements with Sprint preventing them from selling in retail stores?Any thoughts on this? For those who are unaware,you can simply buy an inexpensive ,new android phone(as low as $20 on amazon)and begin using the magicjack app on it for free phone service over WiFI immediately.You don’t have to activate the cellular service..The net10 and tracfone androids are very inexpensive and have several models on amazon as low as $20 brand new.If you have WiFi at home,work and many mobile hotspots like I do, you can get free phone service with the app and may use it as your only service.If you choose to use the magicApp as your only phone service,I would recommend the paid version of the app which is $10/year and lets you choose your own U.S. number.This would give you phone service with your chosen number for .84 cents a month. However,I would still recommend using the magicJack GO which includes 1 year of home phone service and is $35/year ($3/month) after that and using it in conjunction with the magicApp free mobile service over WiFi.The app will also work over 3G/4G(works better over 4G)which can be useful if you have a limited talk/unlimited data type of mobile plan.You can set the app to use your magicJack home phone number. they could deliver for $30 a piece. up to 3 LTE bands, which they market as Spark. having devices made for them. $100 or less is highly doubtful. That hardware is terrible for the price and their entire argument doesn’t hold water because of it. If they would sell it at 40-50$ it would be another matter. Then the specs are sub par even for the low end. Quad A7 is the new dual core and 512 MB of RAM is just too little now when even 1GB isn’t good enough for most budget buyers.